All the carbohydrate a human body can store is not enough to get through the 26 miles and 385 yards of a marathon. Glycogen alone will only get you so far, and you'll still need to go about 40% farther. Fat and protein make up the difference. Guts may figure into it as well. It's a tough race. For some folks, though, the marathon by itself isn't tough enough. So they add to the challenge by running the 26-plus miles on narrow trails. On winding, narrow trails. On winding, narrow trails that climb up and down the slopes of the Lake Jackson Basin. That somewhat describes Gulf Winds Track Club's Swamp Forest Trail Marathon, north of Tallahassee, Florida in Phipps Park. Nothing says "fun run" like the chance of tripping over a root and hurting yourself. Master runner Zachary Grossman won the fifth annual Swamp Forest Trail Marathon on Saturday morning, 6 January 2018, finishing almost a mile and a half ahead of the next runner. Grossman covered the four-loop course in 4:24:26. Jason Huang edged Steven Wilson for second, 4:38:58 to 4:39:10. In 2016 and 2017, Monica Judd raced the half-marathon event at the Swamp Forest Trail Races, collecting a third-place and a second-place finish in the women's division. In 2018, though, Judd decided to move up to the marathon. The longer race agreed with Judd, as the master runner won the women's title in 5:15:36, placing tenth overall. Master runner Lisa Homann was second in the women's standings and twelfth overall in 5:27:15. Megan Federico was the third woman and twentieth overall in 6:12:39. 25 athletes finished the 2018 Swamp Forest Trail Marathon. While the marathoners were making four laps around the loop in Phipps Park, the half-marathoners were content to leave it at two circuits. In the case of Charlie Johnson, though, it was two fast circuits. Johnson won the half marathon for a second year in a row, setting a new Swamp Forest Trail Half Marathon record of 1:28:44. Johnson had set the previous course record, 1:34:17, in the 2017 race. Jon Mason was the fastest master runner in the half marathon, placing second overall in 1:50:07. Jordan Cooper and John Ellis were third and fourth, each in 1:59:00. Kat Sack was the first woman in the half marathon, placing seventh overall in 2:04:55. Melissa Hooke took second in the women's standings, fifteenth overall in 2:14:37. Mary Jane Hayden edged master runner Katasha Cornwell for the third woman's spot, 2:16:32 to 2:16:33. Hayden and Cornwell placed eighteenth and nineteenth overall. 58 athletes completed the half marathon. 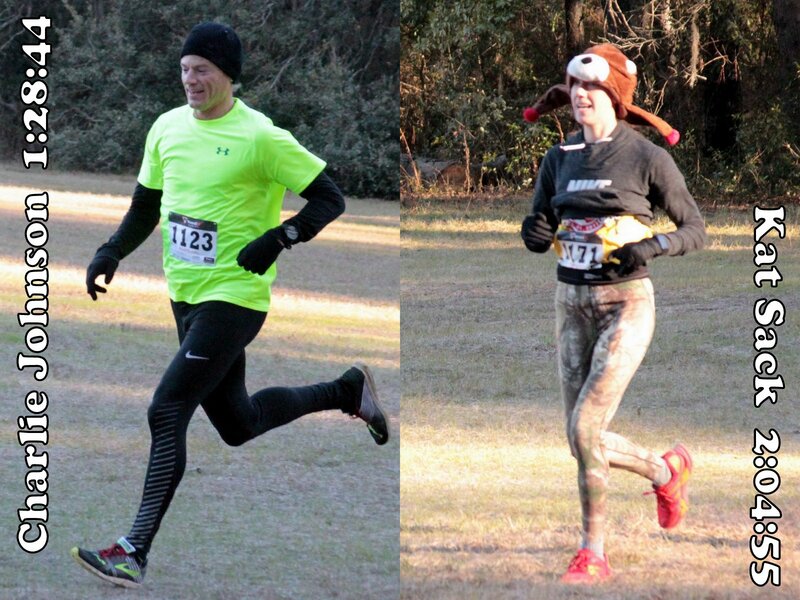 You could argue that after you'd one one lap at the Swamp Forest Trail races, you'd already seen everything on the course. You could also admit that you only wanted to run about six-and-a-half miles. Whatever their reasons, 70 athletes opted for the one-lap option, racing a quarter-marathon. Master runner Eric Sager was the first of those 70 to finish, running 52:51 and winning the race for the second year in a row. Erik Anderson was runner-up in the quarter-marathon, running 54:32. Alex Edwards edged Zach DeVeau for third, 55:34 to 55:37. 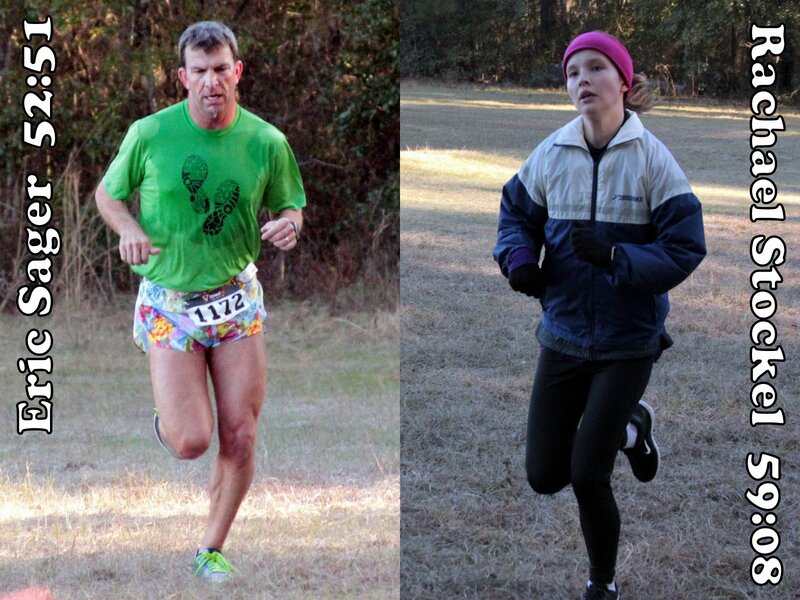 Maclay sophomore Rachael Stockel was the top woman in the quarter-marathon race, placing eighth overall in 59:08--a new Swamp Forest Trail women's record. Alyssa Terry was second in the women's category and twelfth overall in 61:07. Deirdre McCarthy was the third woman and seventeenth overall in 67:15. Alison Dudley outkicked Marien Dimacali 68:20 to 68:22 for top woman master honors. Dudley and Dimacali were 21st and 22nd overall. In addition to being the fifth year of Gulf Winds Track Club's Swamp Forest Trail Marathon, 2018 was also the last year that Jim and Kristin Halley will direct the race. The Halleys led the event for two years after taking over from the race founder, Bobby York. If the Swamp Forest Trail races return in 2019, it will be with a new team of directors.